I’ve always wanted to go skydiving, but I’m a little skeptical of the whole jumping-out-of-a-plane thing. I’m also slightly afraid of heights and have an irrational fear of the parachute not opening. Pretty much, the idea of skydiving was going to stay an idea, until I discovered iFLY Austin, where there are no parachutes, no plane and no elevation. “Everyone has dreamed of flying. 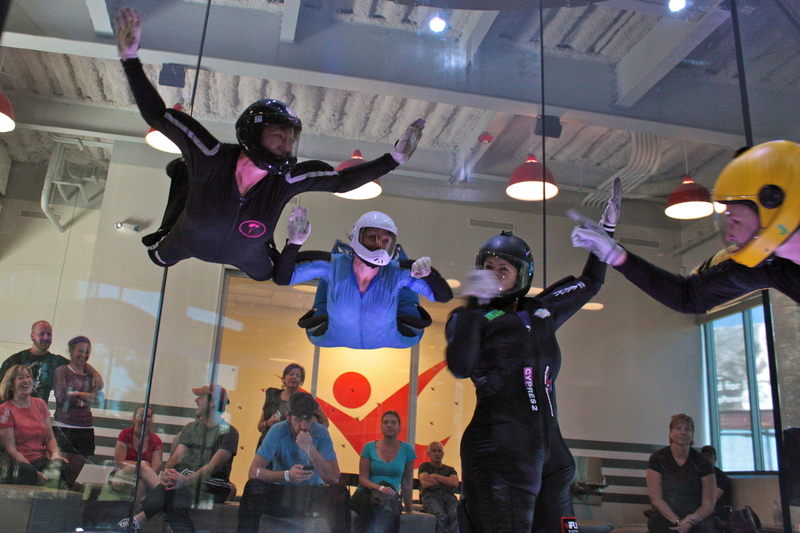 iFLY Austin Indoor Skydiving makes the dream of flight become a reality to ages 3 to 103 years old. There is no jumping or parachute required. No experience necessary and almost everyone can fly," Ryan Brown, general manager of iFLY Austin, says. 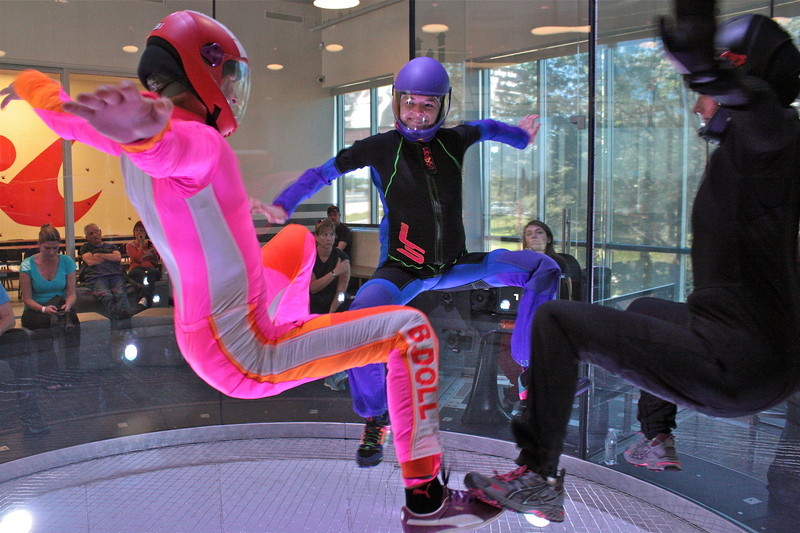 In 1998, SkyVenture invented the first indoor skydiving facility. The wall-to-wall air simulator was a huge success and there are now 28 tunnels worldwide. Austin is the only city in Texas that has an iFly facility, but iFly Dallas will begin taking reservations in late November. Popular to the general public, iFly also serves as a training facility for the military. “The technology behind iFLY is the vertical wind tunnel (VWT). Vertical wind tunnels have been used for years by the military and professional skydivers as a way to train without having to go up in airplanes,” Brown says. Before you take flight, you must gear up in a full-length body suit, helmet, goggles and ear buds. Once you step into the glass-enclosed wind tunnel, you can’t hear a thing, which is why the instructors use hand signals to communicate with the flyers. For first-time flyers like me, the instructor guides you from the boarding zone to the flying area where you immediately shoot into mid-air. While hovering above the giant fan, your face begins to flutter in the wind, creating the same sensation you would get if you were free-falling from a plane. Unless you’re an advanced flyer, you have little control over which way your body will move. As I began my flight, I tried to adjust my goggles and quickly realized this wasn’t going to happen. My arms were flailing in every which way and the instructor told me to relax by flashing the hang loose symbol. It’s not uncommon for your body to tense up in such an unfamiliar environment, but the flight becomes much more enjoyable once you relax. And ,of course, be sure to smile because there are cameras documenting the entire experience. During your second minute of flying, the instructor takes your arm and guides you around the tunnel. I know I said you can’t hear in the tunnel, but I’m pretty sure the instructor heard me yelling some choice words when he rapidly spun me. Oh, and did I mention that there’s seating outside of the glass tunnel where your friends and family can watch you fly? After seeing the video of my flight, I noticed my terrified expressions were quite humorous for the spectators. The 2-minute adrenaline rush isn’t cheap, but I think the $60 is worth it. Indoor skydiving is like a roller coaster — you’re terrified while you’re doing it, but after you want to go again.